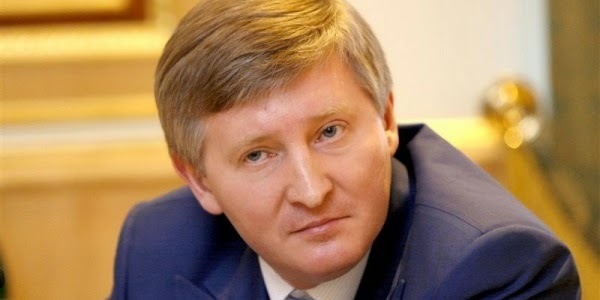 DONETSK, Ukraine -- Ukraine's richest man Rinat Akhmetov has issued a strong call against pro-Russia separatists fighting government forces in the east, which he described as a "fight against the citizens of our region" that has devastated Ukraine's industrial heartland. "Is looting in cities and taking peaceful citizens hostage a fight for the happiness of our region? No, it is not!" the metals tycoon said in a video statement. Akhmetov vowed to challenge the insurgents who declared independence last week in the eastern regions of Donetsk and Luhansk, an area of 6.5 million people. "No one will frighten us, including those calling themselves a Donetsk People's Republic," he said. Akhmetov had initially taken a noncommittal stance as the mutiny engulfed the east, drawing criticism from the authorities in Kiev. But last week, his company organized citizen patrols of steelworkers who worked alongside police in the Black Sea port of Mariupol to improve security. The move forced insurgents to vacate the government buildings they had seized in the key southeastern city. The tycoon urged all workers in eastern Ukraine to hold peaceful protests at their companies by blowing sirens Tuesday "in support of peace and against bloodshed." He suggested they keep up those protests in the coming days. It was unclear if his call had a broad following. Interior Minister Arsen Avakov quickly hailed Akhmetov's move, saying on Facebook that "the people's power and energy will sweep the terrorist scum away better than any counter-terrorist operation." One of the leaders of rebels in Donetsk, Denis Pushilin, retaliated Tuesday by threatening to nationalize Akhmetov's assets over his refusal to pay taxes to the Donetsk People's Republic. Russia has scathingly criticized the new Ukrainian authorities -- who came to power in February after a pro-Russian president fled -- for using the military against the rebellion. Ukraine is holding a presidential election on Sunday, which the government in Kiev hopes will unite the country behind a new leader. Election officials in Donetsk, who were working frantically to prepare for the May 25 presidential poll, had to shut down their office due to threats from the separatists, Reuters reported. "We're not working out of safety concerns," said election commission member Volodymyr Klotsky. The commission made its decision after "terrorists" seized the offices of another voting commission nearby, Reuters reported. According to the report, Klotsky said unknown men appeared at the office, stealing computers and threatening staff if they did not leave. "It is the interference of these people, who have grabbed the region by force, who have placed checkpoints around the city to protect it from something. We are worried that either tomorrow, either now, either on election day, they will come and stop our work physically," he said. "We have information on a number of presidents, of vice presidents of electoral commissions being abducted, being maltreated, with implications for a number of other members of the commissions," Ivan Simonovic, U.N. Assistant Secretary General for Human Rights, told Reuters. Separatists exchanged fire again Tuesday with government forces on the outskirts of the eastern city of Slavyansk -- the epicenter of the rebellion against the government -- but this time anger at the fighting appeared to be growing. Russia's Defense Ministry also said its units were dismantling their camps along the border with Ukraine and preparing to leave for their home bases. A day after President Vladimir Putin issued a pullout order in an apparent bid to ease tensions with the West, the ministry said the army units in the Bryansk, Belgorod and Rostov regions bordering Ukraine were getting ready to leave. NATO, which estimates that Russia has 40,000 troops along the border with Ukraine, said it is watching the situation closely, but could not yet confirm a change. NATO spokeswoman Oana Lungescu on Tuesday challenged the Russians "to prove that they are doing what they are saying." The Russian Defense Ministry said it would take time for troops to dismantle their camps and load equipment on trucks for a march to railway stations. It didn't say how many troops were being pulled out or how long it would take. Footage broadcast by Russian television showed what it said were troops on their way out, but their exact locations and routes remained unclear. Putin's order to withdraw troops from areas near the border and his support for Ukraine's presidential vote, which he had previously sought to postpone, appeared to reflect a desire to de-escalate the worst crisis between Russia and the West since the Cold-War era. The U.S. and the European Union have imposed travel bans and asset freezes on Putin's inner circle over Russia's annexation of Ukraine's Crimea Peninsula. They have threatened to target entire sectors of the Russian economy with sanctions if Russia tries to grab more land or attempts to derail Ukraine's presidential election. Russian Prime Minister Dmitry Medvedev said Monday that his country is preparing retaliatory steps in response to potential sanctions, but would not elaborate. “We are slowly but surely moving toward a second Cold War, which no one needs,” Medvedev told Bloomberg News.